The Sheila Geibig Agency - Nationwide Insurance is now open at 400 West Rosemary Street, Suite 1006 - just down from Mama Dip's Restaurant. After 13 years located in Carrboro, Sheila is excited to be doing business now in downtown Chapel Hill! The agency is committed to providing world-class, full-service to its customers by offering all types of insurance such as homeowners, auto, commercial, general & personal liability, life, and more. The agency delivers "On Your Side" service as well as sells bonds, has a notary on staff, and is a bilingual agency. Give them a call today at 919-968-4321 and visit their Facebook Page or at http://sheilageibiginsurance.com/. Free Movies & Popcorn from the Town! Enjoy fun for the whole family on days-off from school when the Chapel Hill Parks & Recreation Department presents two, great FREE movies! Thursday, December 22 at 6PM, The Polar Express in 3-D. Special 3-D glasses will be provided to all for the movie. And on Tuesday, December 28 at 1PM, Toy Story 3. Free popcorn (while supplies last) -so bring something cozy to sit on like a pillow or sleeping bag! Children under 10 must be accompanied by someone over 18. Both movies are rated G. Hargraves Community Center is located at 216 N. Roberson Street. For more information call 919-968-2784. At Glee Kids this week almost all fall clothing has been marked down - and, Glee Kids is offering an extra 10% off all Tea sale items from now until Christmas! Come and check their growing selection of great gifts -- guaranteed smiles for babies, toddlers, and big kids! Glee Kids is located in University Square (next door to Time Out). For more information visit www.gleekids.com. Better than a sweater, flowers are always the right size! Chapel Hill Florist has seasonal and Christmas flower arrangements and gifts that can be sent nationwide to loved ones! Chose from wide selection of wreaths, centerpieces, and bouquets as Christmas decorations and gifts. Chapel Hill Florist is located at 200 West Franklin Street. Call 919-929-2903 or order online at www.chapelhillfloristltd.com. 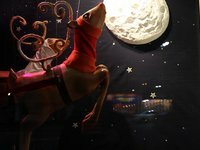 Click on picture to watch a wonderful video of the window display! Get in the holiday spirit and bring the whole family to The Franklin Hotel this year! The owners of downtown's landmark hotel have inaugurated a new Christmas tradition in the four, street-level, display windows by commissioning a 3D winter scene. Visit the hotel any evening through early January and you'll find groundhog Santa Claus and his eight reindeer, hand-carved and painted just for the hotel, taking off on their Christmas Eve journey. Wintergreen Hospitality commissioned the hotel's agency partner Sprocket House to conceive and build the display in advance of the annual Chapel Hill Christmas parade, which passes in front of the hotel. For more information visit www.franklinhotelnc.com. Uniquities is the place to be for the season's warmest outerwear! Scarves, gloves, hats, and sweaters to warm you up this holiday season! From designers Patterson J Kincaid, Theory, Woolrich, Line, Tolani and more. Uniquities is located at 452 West Franklin Street - under the pink awning. For more information call 933-4007 or visit www.uniquities.com. Still have that certain someone on your list that always proves hard to shop for? Well Chapel Hill Comics has made it easier to pick something out -- with their annual Holiday Gift Guide! Choose from stocking stuffers or for larger gifts. Items include graphic novels & comics, stuffed animals, posters, toys, key chains, playing cards, figurines,and so much more. And while you're there - drop into the back gallery to view the Kids' Art Show! For more information visit www.chapelhillcomics.com. Peacock Alley will be open Christmas Eve from 9AM to 1PM. Don't miss the After Holiday Sale beginning on Tuesday, December 28th at 10AM with huge savings. Holiday items are 50% OFF, select items are 30-50% OFF, and most everything else in the store is 20% OFF! Free front door parking is always available. Peacock Alley is located in University Square at 123 West Franklin Street. For more information call 919-967-2152 or visit www.peacockalleygifts.com. This holiday season Krispy Kreme has the perfect gifts and stocking stuffers for you and your family and friends - 2011 Wall Calendars featuring Krispy Kreme road signs are filled with four special coupons each month. Each calendar costs $5 and has more than $75 worth of money-saving coupons. New this year is the collectible holiday tin filled with a delicious sugar cookie mix, sanding sugar and a dozen holiday gift tags, each with a free offer on the back. 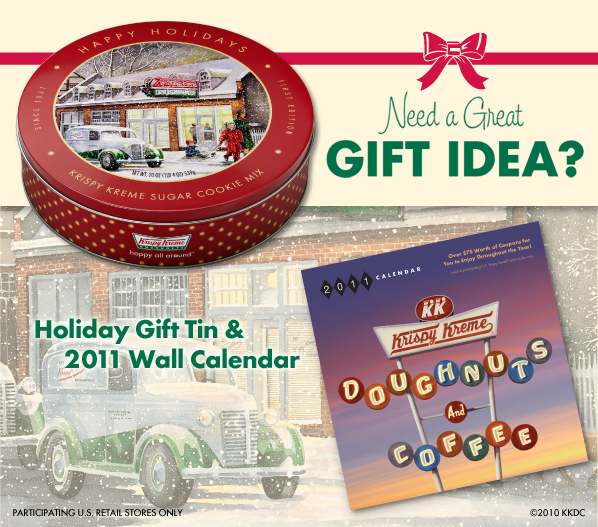 Holiday tins sell for $9.99 each or $8.99 each with the purchase of a dozen doughnuts. So stop by Krispy Kreme today for these great holiday gifts! Krispy Kreme is located at 157 East Franklin Street - click here for their Facebook page. Thursday nights are $4 Free-Range 'Whichburger night! The 'Whichburger starts with hand-formed Painted Hills ground beef, grilled medium, and is served with lettuce, juicy tomatoes, shaved red onion, and melty Wisconsin cheddar on a grilled potato bun. Saturdays feature every single bottle of wine at 1/2 price. The carefully chosen wines at SANDWHICH represent unique flavors & characteristics and exceptional value. Open Christmas Eve and New Year's Eve for lunch! Remember that Monday-Saturday starting at 5PM, SANDWHICH participates in the free valet parking along West Franklin Street. For more information on SANDWHICH visit www.sandwhich.biz. What's the best thing to do the day after Christmas? Get the kids out of the house and go to Kidzu Children's Museum - and admission is always FREE on Sundays at Kidzu! Hours from 1PM to 5PM. Parking is also always FREE in downtown Chapel Hill on Sundays! For more information visit www.kidzuchildrensmuseum.org. Carolina Science Cafe at Top of the Hill Here's your opportunity to explore science topics making national and international headlines and to meet the experts behind the headlines! The Morehead Planetarium's Carolina Science Cafe, held in the Top of the Hill's Back Bar, is a FREE monthly educational program for adults, offering a behind-the-scenes look at cutting-edge research. On Thursday, December 30 at 7PM join solar cell specialist Ken Varner to explore 21st-century solar energy and the race for higher efficiencies at lower costs. Talk, listen and learn! For more information visit www.moreheadplanetarium.org. Ring in the new year, on Friday, December 31st, with local legends The Nomads at Breadmen's Restaurant, located at 423 West Rosemary Street. Enjoy great music, dancing, a Champagne toast, and a midnight breakfast buffet. But mostly just enjoy a really great time to welcome in the New Year. Bring your family, your friends, or the guy down the street - but be prepared to dance with him. No one can resist dancing when The Nomads are playing. Only $45 per person! Email Robert Humphreys for more information or for reservations at mrchapelhill@nc.rr.com. La Residence is now booking for holiday parties. Experience their award winning wine list, a seasonal menu featuring fresh ingredients, and warm ambiance in the heart of downtown Chapel Hill. On New Year's Eve enjoy a special Four Course Dinner for $45 per person. La Residence Restaurant is located at 202 West Rosemary Street. For information visit www.laresidencedining.com.